Does “˜My Documents’ sound like a contradiction in terms? In Vista, we impersonally call it Documents but do we really pay attention to this folder which is one of the most important ones in our system? Of course, it is not the only folder we have. But it usually is the default one called by the system when it needs to save something. And here lies its value as a time saver or its Achilles Heel – it depends on the way we manage it. My Documents is the common folder which by default stores all our personal data i.e. our document files, music, movies, downloads and photos. Within it has the My Music, My Videos and a My Pictures folder to stash a particular file type. So it pays to deal with it like an important filing cabinet and not as a junk drawer. Over time this folder becomes the “˜Big Daddy’ of all folders. Our personal data storehouse thus needs to be handled well and safeguarded from a digital disaster. It can be done by simply moving it to a safer backup location. 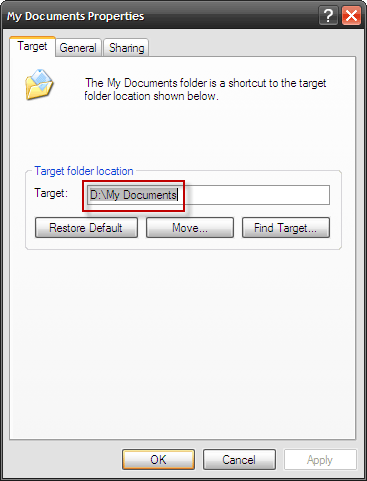 In this article we are going to show you how to move the My Documents to a different drive. There are two serious reasons to do this with immediate effect. Imagine that all your precious documents, photos and sundry other files are organized beautifully in this folder on the system partition (commonly the C Drive). 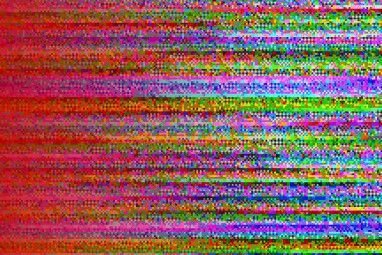 Imagine a system crash. Imagine the loss of never able to recover that data. And now imagine a simple step which could have saved the day. The usual good word is to partition your hard disk into multiples with a minimum size kept for the system drive. With time My Documents will fatten up as more data is stashed away in it. Moving the folder to a different drive saves space and more importantly safeguards it. Right click on the My Documents icon on the desktop. Click on Move and choose your chosen location for the folder. Move it to a different partition. For instance, I have it on my D Drive. Click Apply and then Ok. A prompt will ask whether you want to move all of the current documents to the new location or not. Choose Yes. All your documents are switched to the new location and it’s all like before except now they are safer from a system crash. These are the elementary steps which will save you a ton of bother at a future date. Right-click on Document. For multiple users click your account name in the right-hand menu. Select Properties. In the Properties dialog select the Location tab. Next, click on Move. 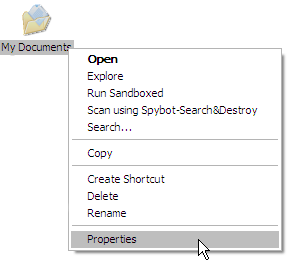 In the Destination dialog select the new location for your Documents folder. 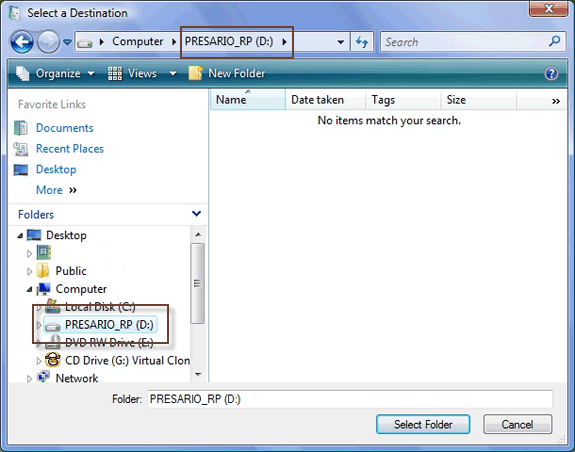 Click on Select Folder to return to the Properties dialog. The new location appears in the text box. Click on Ok. Vista prompts you to confirm again and with a Yes click your task is done as the documents get shifted over to the new location. The brief tutorial might be simplicity itself and experienced users might even scoff at it. But I have seen many neglect this fundamental step of data backup. And isn’t it true that the small things we take for granted are sometimes taken away from us. With few uncomplicated steps, at least it won’t be the documents in our My Documents folder. Have there been times when you have found movinf My Document folder to a different drive a lifesaver? Or have overlooked it to your loss? Explore more about: Data Backup, Digital Document, File Management, Windows Vista, Windows XP. Thanks for the Windows 7 link. Very helpful and I have implemented this. However, all the folders for My documents, My Pictures, and My Videos got duplicated in the My Music Folder as well as separately. I don't think these are copies, but seem to be pointing to the same file. I started with My Music, and all the other 'My' folders I mentioned above are under My Music as well. Is there a way to fix this? Finding it difficult to understand from here what exactly went wrong. All the 'My' Folders got duplicated in the 'My Music Folder'? 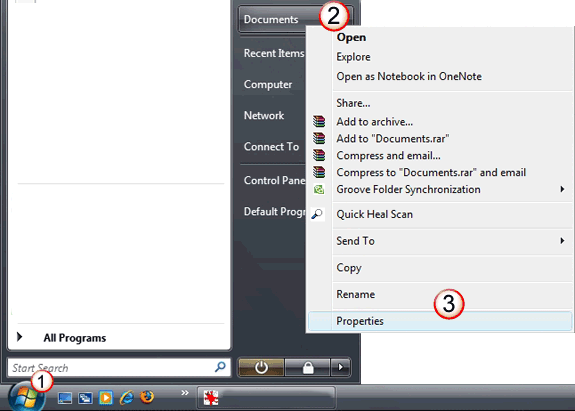 Right click the folders in question and check the 'Set Save Location' and 'Include Folders' options once again. Maybe, there's an error there. can you update this post for Windows 7? Pretty similar. But here is the official Windows Help page with clear steps. 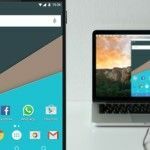 "And whatâ€™s more: you can even move the desktop folder! This is really useful, since most of the people like to keep their stuff there instead of My Documents." I prefer XP though since Vista disappointed me several times with no solutions available on Google or forums. In XP I moved the desktop to another partition by simply cut pasting it. Transferring all clutters to another partition sped up my XP like new. One option people might want to consider: http://www.dropbox.com where you can get 2 free GB's of synchronized, online storage (can grow to 5 free GB's based on referrals you sign up ... there are paid plans after that. Comes with a dropbox application which seamlessly integrates into Windows Explorer, making that online dropbox just another drive, albeit remote, on your computer. You can also share folders you create with other invited users and collaborate on ... whatever. So, it's not a lot of space (at least free space), but then ... you can also set up multiple accounts (With different email addresses) ... and with some selective backups of important files, folders, etc., it's a cheap way to get some remote protection of stuff you just would not want to lose. "This information is considered pointless by authorities as when a hard drive crashes"
Then move it to a different drive entirely or a network drive, which is the reason this ability is built into windows in the first place. I feel sorry for the author. A bunch of people screw up their documents path becasue they are clueless and blame him for it. Only if the authorities had been around to save us from this carnage. HELP PLEASE!! I AM GOING CRAZY, I JUST TRIED TO DO THIS AND ALL MY DOCUMENTS ARE GONE!! I WAS AT STEP 3 AND WHEN IT ASKED IF I WANTED TO MOVE ALL THE DOCUMENTS TO DRIVE D I CLICKED NO BY ACCIDENT AND NOW I OPENED THE FOLDER AND THEY'RE ALL GONE! HELP PLEASE :'(! 4. In the Move Documents box, click Yes to move your documents to the new location, or click No to leave your documents in the original location. Look on the internet to see what I mean. I won't go into detail heheheh. I have done this already, but for somewhat different reasons. I bought a 40gB laptop a few years back. Turns out the 40gig was 2x20Gb, so after a while I had messages telling me I was almost out of storage space, since everything- my documents, program files, OS- was, by default, on the one drive. 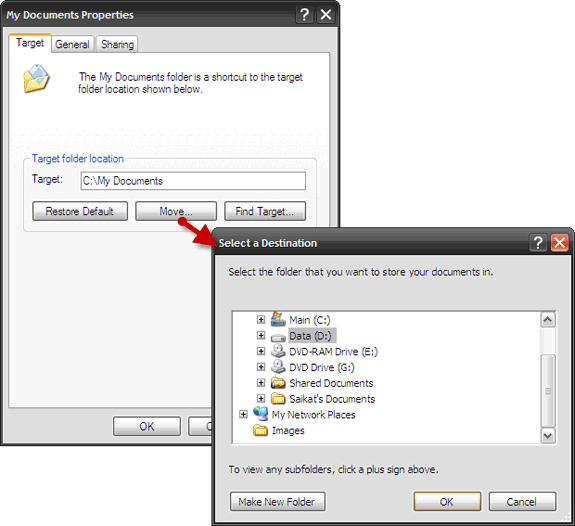 I shifted all users' "my documents" and shared documents to the D drive, thus sharing the load. I just wish it was set up like this to begin with. 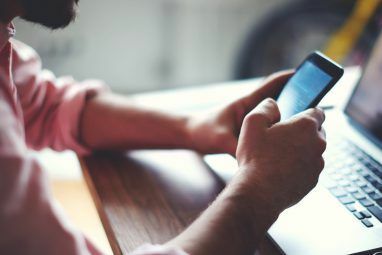 You should update the article so that it is clear to people that moving the "My Documents" folder will not safeguard against hard drive failure. Even if you partition your hard drive, there is a possibilty of the hard drive getting phisycally damaged. And this does happen a lot. There are many ways to backup your data: external hard drive, CD, DVD, USB drive, etc. Choose whatever method, but the takeaway message to avoid data loss should be to backup your data and not just move it to a separate drive. Okey this tip sucked, actually it was a good tip in tougth but it has messed up things on my vista instalation now, since it prompted about making the file witch was not mentioned in this article i selected just the drive d as the new location......Big mistake. Now it semes to be stuck there and trying to revert it to deafault in order to fix it does not work either. In other words its stuck! at the a wrong location. This is one of the best things you can do for yourself. Keeping your data on a separate partition makes backups easier and faster. It also allows you to easily reinstall or upgrade your OS without worrying about the data. Windows Vista is much more powerful when moving user's folders. Since "My Images", "My Music", etc. are out of My Documents, you can move them as well to another location. And what's more: you can even move the desktop folder! This is really useful, since most of the people like to keep their stuff there instead of My Documents. Microsoft's TweakUI utility does a nice job of this, as well. Under My Computer/Special Folders (on the XP version--I don't have a Vista machine handy), the interface is a little more straightforward to my eyes. Plus, you can change a bunch of other things, too, like the shortcut arrow. One of the reasons you gave to move the folder is because of a system crash. Are you saying that the D drive will not crash? Or is it less likely to crash? I thought that the best way to handle hard drive crashes was to have backups. Of course you can. 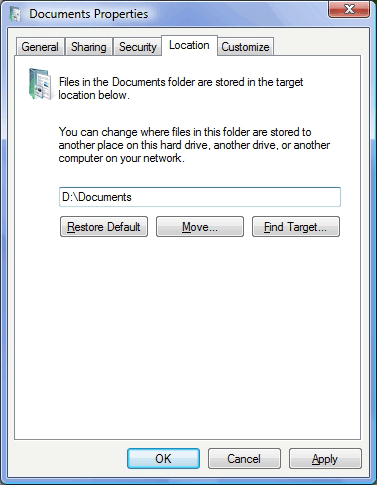 But the My Documents folder is the default location for your document files etc. You will notice that it is one of the options that comes up when you pop in an external media or when you want to open or something. Also it is one of the default folders given in the folder sidebar (Other Places) of XP. Makes things a lot easier. A separate external disk is of course the best solution. But backing it up to a separate partition is the first solution for people who don't have an external drive or any other media. Especially in my country, for normal use very few people have external drives. Here we have 260GB HDD which is sufficient for normal storage, so there's no need to go for an external one.Regular backups of the D Drive folder to other media like CDs is always recommended.For instance, I have mine on a pen drive. stupid question: why move it? you can not create a new one?